This is a silver half-ruble, or poltina (from the prefix pol- or half-) of 1826. It’s the first year this particular “wings down” design was used, and it only ran to 1831. The top reads “Poltina Coin,” the bottom is the date. НГ is the initials of the mintmaster, Nikolai Grachev. The eagle itself bears a shield with St. George on it, the traditional symbol of Muscovy. 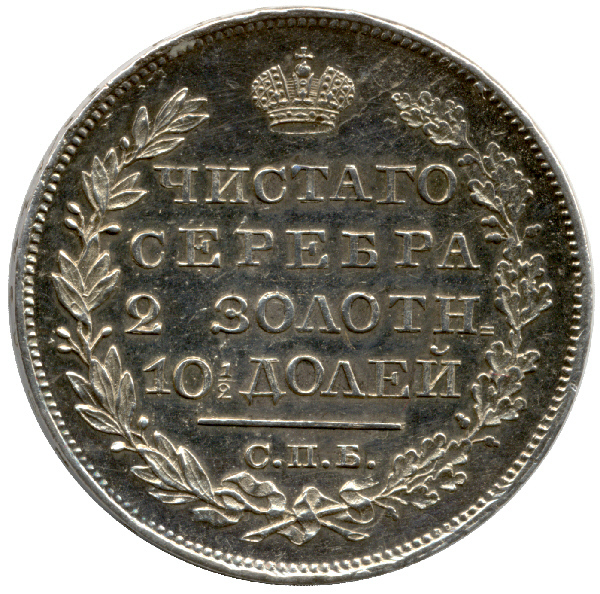 The inscription reads, “Of pure silver, 2 Zolotniks, 10 1/2 Dolei” (which works out to almost precisely nine grams of pure silver), and the mintmark for St. Petersburg. R. W. Julian (yes, that R. W. Julian) has done a lot of work on Russian coinage and has written a book covering silver coinage for the period from 1797-1917. There is a short section near the front of this book where he lists ten particularly tough types for a collector to find (if they are assembling a type set, which I was), and this coin, plus the wings down 25 kopeks (quarter ruble) were among them. Which is why I jumped on this coin when it showed up; it’s not only one of the toughies, it’s in fantastic condition. This coin came in handy for another reason. When building my Russian Coins Of Conquest exhibit, I needed a warlike graphic, as a sort of “logo” to tie the exhibit together and add visual interest. Quick searches of the internet turned up nothing that wasn’t cheesy or just not what I had in mind. Then it dawned on my that I had literally hundreds of scanned in images of Russian Imperial Eagles, and I settled on this particular coin because of its superior condition. I chose the wings down eagle because it’s the only style the Russians used where the eagle is clutching arrows and a wreath, indicating war and peace–surely appropriate for an exhibit about occupation and regional coinage. I could almost imagine a stamped metal eagle like this gracing the cap of an officer in the Russian Army or police in the 1820s or 1830s. (Would he be a full bird colonel?) 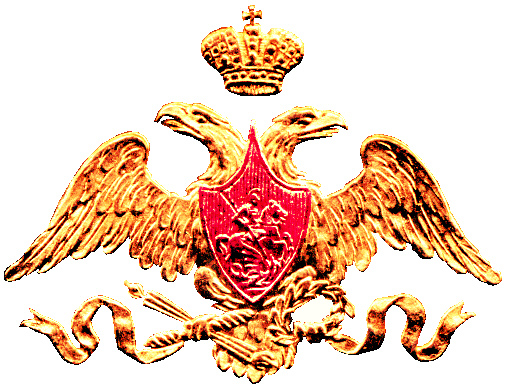 I’ve seen this eagle motif on at least some of the shoulder patches of today’s Russian military (with the crown, even though it’s a republic today). Voila, one graphic suitable for use in an exhibit. Few who have seen this exhibit (and I still have the coins for it and will often display it non-competitively) realize that the decorative eagle graphic was really a picture of a coin! But if you go to an ANA show, there’s a good chance you will see this exhibit, and you will know. 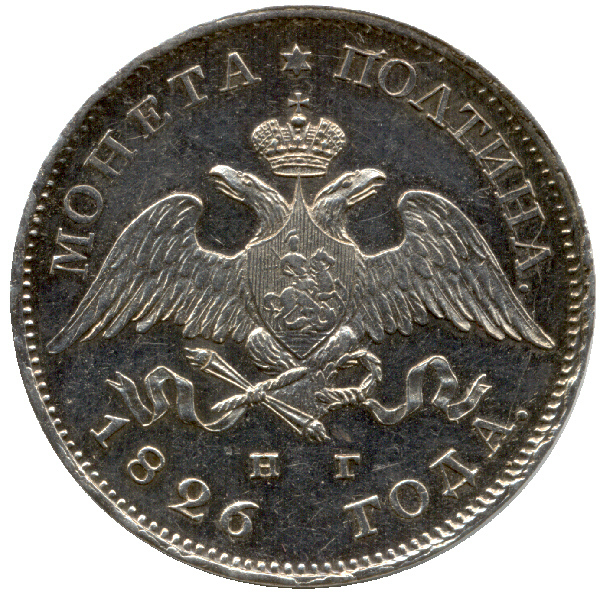 This entry was posted in Exhibiting, Nicholas I, Poltinas, Russian Imperial, Wings Down and tagged Coin, Nicholas I, Poltina, Russian Imperial Coins, Wings Down Eagles on March 21, 2013 by steveoncoins.